Chances are you've dealt with Milia before. 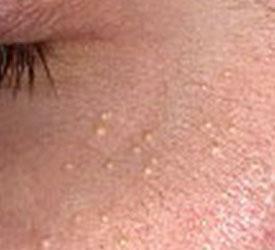 They are the small white bumps that are usually around your eyes but you can also find them on other parts of the face. You can also get them at any age. A lot of newborns have them. They can be mistaken for pimples (because of the white head), but they won't budge if you try to pick or squeeze it (which you shouldn't anyway!!!). They happen because your skin doesn't naturally exfoliate enough, so dead skin cells get trapped. Use lighter products. Heavy products will clog pores. Look out for either oil free formulas or ones that say "non comedogenic." Use an oil free sunscreen. Exfoliate. If you use heavy creams or make up, it's even more important to wash it away twice a day and exfoliate 2-3 times a week to help cell turnover. See a dermatoligist. They can either manually extract it, or use microdermabrasion or apply a glycolic peel to exfoliate the skin. See here for what eye cream I'm currently using that doesn't make my eye area break out in milia. My husband gets these as a side effect of skin creams he has to use.